We know this. But in the face of such major, systematic problems, is there anything we can really do? Can an individual or a single community have a voice? You bet! We’re making a documentary about groups driving change in their communities. Searching 4 Opportunities is me, Oksana Anasko an IMPACT! alumni, and Adrian Eguiluz. We’re going to Ukraine, a country with a deep, multi-dimensional crisis. 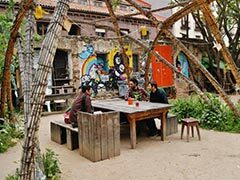 Against all odds, Ukrainians are getting organized and coming up with creative, sustainable solutions to challenges that can be found all over the world. In Ukraine, we’ve found a group of lawyers gathering people´s real requests for direct democracy, a new organization for human rights, and a theatre group going to conflict zones to discuss oppression and human rights. There are so many amazing people working together for a more democratic and sustainable society. This documentary is about them and the great work they are doing. You can learn about them more on our Facebook page. I’m a Ukrainian environmentalist and I participated in the EuroMaydan revolution and Adrian is a Spanish social worker from the “Indignados” movement in Spain. 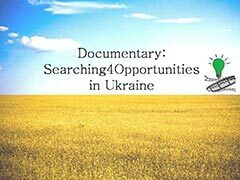 Based in Edmonton, we connected over a great idea and tons of passion, backed by academic research, support from the University of Alberta´s Canadian Institute for Ukrainian Studies, and a little bit of movie-making experience. But a big piece was missing: the resources to complete such a challenging project. It was time for a new plan, so we followed up with IMPACT! Mentor, Jonathan. He helped us clarify our objectives, gave us ideas on how to approach potential founders, and proposed a couple of funding bodies to which we could submit our project. Now we have a few project proposals waiting to be approved, messaging for potential investors, contacts to seek advice, and a crowd funding campaign that is starting to grow. Our project feels possible! Learn more about our initiative here, share your feedback, and please consider supporting us. Sign up for the next session of IMPACT! Sustainability Champions Training in Sudbury! Learn more about the IMPACT! Sustainability Champions Training here.